"Shadows in My Room": Kayla sees shadows in her room that disturb her. Her mother answers all her questions about each shadow that she points to and helps her to calm down and go to sleep. "What's That Noise? ": Amber hears noises that disturb her, such as the wind and thunder. Her mother teaches Amber to use her imagination by turning something fearful into something fun. This was a wonderful audiobook for children about using their imagination to calm their fears. There were two stories. In each the parent teaches the child to use her imagination to help explain away her fears. This audiobook was well produced. The narrator had a soothing voice and told the story in a way that would make any child relax before bedtime. The pace was perfect and unrushed. There were also sound effects to enhance the production. As an adult I enjoyed listening to this book so I think that children will love it. In particular I think it is good for younger children who are apprehensive about shadows and noises before bed. It is definitely a book that will help to calm their fears. I would like to thank the author/narrator/publisher for gifting me a copy of this audiobook in exchange for an honest review. All thoughts and opinions are unbiased and my own. These adorable children's stories were a fantastic break from the everyday. They were fun to read as an adult and ones that I would definitely read to my children. This will become a staple on our audio-shelves. Would you listen to Shadows in My Room & What's That Noise? again? Why? It combines sweet and educational bed time stories. Smart bedtime stories are a treat both for children and the parents. Which character – as performed by Heidi Allred – was your favorite? The chapter about the Thunder. The little girl was first scared, but after her mother explained the concept to her, the girl stopped being afraid . I loved How Linda wrote the scene, the simple way she made of having the mother explain things. The use of imaginations as a way to overcome fears was done beautifully. I liked all the stories. Loved the connection between the mother and child. Linda Weaver Clarke's stories combined with a great narration by Heidi Allred make this audiobook a winner. Cute stories for little ones. These short children stories were really cute and they are a fun way to explain shadows and noises. If you have little ones I think you will enjoy listening to the with your kids. 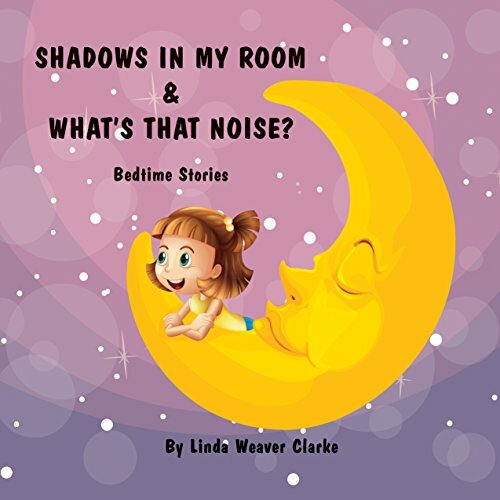 "Shadows In My Room & What's That Noise: Bedtime Stories" by Linda Weaver Clarke is a quaint duo of heartwarming children's stories for nighttime. In both of these stories, a mother helps her young daughter understand her night-time fears, including the proverbial "monster under my bed." While listening, I couldn't help but recall my own experiences as a little girl who would swear I saw ghosts in my window, when in fact it was just a shadow of the hallway light. To this day, I fondly refer to this ghost as my old friend. Linda Weaver Clarke's writing is much like that, very calming and like an old welcomed friend. To this day, I also love to sleep during thunderstorms, which is the point of the second story. Heidi Allred did a great job narrating, which contributed to my enjoyment of this book. I listened to the Audible version of this book, which is also a children's picture book. I really hope Amazon makes it a Whispersync version as my daughters used to love to listen to books while looking at pictures before they learned to read. Even though I hope this book gets the full Whispersync treatment, you don't need the picture book to enjoy it. This was a cute Audible book that I recently listened to. The stories last a total of about 18 minutes in length' and are stories of mother's comforting their girl's bedtime fears. I read other reviews which mentioned that there were pictures, however, I only saw the cover picture in my Audible version, unless my phone app was not working properly, which is certainly possible. The narrator was Heidi Allred. It was a sweet book which I think that my grandkids would enjoy. It is written for younger children and shows the trust between mother and child. Very nice job. What did you love best about Shadows in My Room & What's That Noise?? This is a lovely book for your child to listen to at night especially if they are in any way anxious at bedtime. The stories talk through some of the most common fears little children have; scary shadows and noises, and explains them away in a cute and fun way. I also loved how the mother sang a little hymn to lull the child to sleep at the end of each story, as a signal that it was time to sleep. I can imagine that with repeated listening a child would naturally pick up on this cue as well. What made the experience of listening to Shadows in My Room & What's That Noise? the most enjoyable? The stories were vivid and easy to imagine. Loved the reader, she had a great mom voice and a good child-like quality. I enjoyed the second story, which featured the thunderstorm, the best. I might use those ideas on my own daughters. I enjoyed the little girl, Kayla. The stories were all very sweet and sentimental. I listened to the book on a walk on a beautiful afternoon, but I plan to go back and have my daughter listen again with me! This is my first picture book to listen to. Not having the book to look at the pictures, I wasn't sure abut how much I would like it. But I'm happy to say that I was impressed! With the author's words and the voices of the narrator, I didn't need the book. The words flowed with emotion and fun. I look forward to more from Linda Weaver Clarke and Heidi Allred. I was given a copy of this audiobook in exchange for an honest and unbiased review.